Take a break from the snow and head to southern Utah for some of the best hiking and biking in North America. And yes, in Zion National Park — summer starts in spring. Zion offers spectacular mountain bike trails with excellent marking and maps. Shuttle buses have bike racks to pick up weary riders, or to transport you start the day from a fresh spot further down the trail. The Pa’rus Trail runs from the Watchman Campground all the way to Canyon Junction and provides a level, paved trail for both bikers and hikers. This is the only trail within the park that permits cyclists, but there are plenty of other bike trails nearby. Just west of Zion, Gooseberry Mesa is a relatively new addition to the Utah trail system. The short, 800-metre trail offers some serious technical challenges and the side trails let you test yourself even further. The climbs aren’t steep, but the tortuous terrain doesn’t allow much time for planning. If you miss a turn and hit the dirt, take a minute to check for dinosaur tracks; the soft sandstone captured marks of beasts from the Triassic and Jurassic periods. Near the town of Virgin, this fast-and-furious trail is a chance to go all-out on the desert floor. At one point there is a cliff-side ride along the Virgin River, and only one tricky switchback to slow you down. At nearly a 20-km round-trip, some opt to take the shuttle up to the top and blaze down the trail at full speed. This can be taken as an offshoot of the JEM trail and climbs the cliffs to a scenic view of the area. The 12-km trail is not terribly challenging and many ride it as a loop. A more challenging ride can be done by starting Hurricane Rim Trail at the top (park or take the shuttle), riding down to join the JEM Trail and then taking Gould’s Trail back to your starting point. The entire loop covers 35 km, has several altitude changes and is mainly out in the open. Pack sufficient water and snacks for the journey. Zion National Park is 590-sq-km and hiking trails are usually designated by area. One of the more popular sections is Zion Canyon. From April to October, the area is accessible only by shuttle, a service that offers multiple stops to access all of the different trailheads in the canyon. This is an easy, but picturesque, 3.2-km loop that can be crowded in the summer (so do it in spring!). The trail is paved, but may have sand or debris on it. Take the extra minute to step into the river at the Zion Narrows near the end and wade in the shallow water to feel the power of the Narrows. A bit more difficult, but still only five kilometres, this is a trail of waterfalls and rippling pools. Getting to the upper pool takes a bit of effort but can still be done by most hikers. Much of the trail is shaded and lush, making this a great choice for a hot, sunny day. During the summer, this is a horse trail, but winter hikers will find it free of most equines. The loop is a short five kilometres and has a reasonably strenuous ascent that climbs 150 metres. The scenery is the real reason to do this hike, with views of the Patriarchs and other nearby mountain ranges. This is a 13-km hard climb for serious hikers and you’ll want to plan at least five hours to complete the loop. 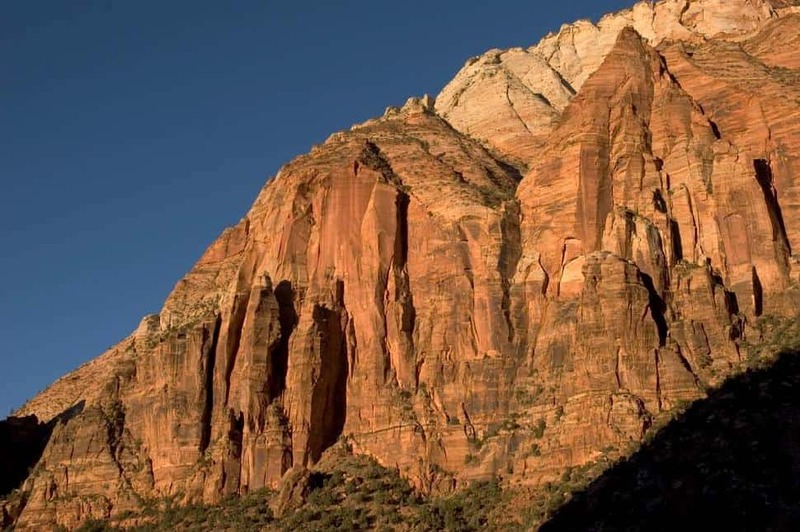 As the name suggests, you’ll be heading to the top of Zion Canyon on narrow, sometimes precipitous trails. You’ll ascend more than half-a-kilometre in what seems like one endless uphill, with no shade and no water. Before choosing this for your day’s adventure, check with the visitor’s centre to find out about ice and snow on the trail.